Summer is passing too quickly. I love the laid-back pace and long evenings outdoors, but suddenly back-to-school sales are everywhere and I'm certain the first changing leaves are just days away. School doesn't begin until after Labor Day, but it already feels like summer is beginning to wind down. I managed to keep up with my #100HappyDays project this week and am closing in on the half-way mark. Among my favorites were a literary cocktail, black-eyed Susans from the garden, and my leather-bound Jane Austen set. What made you happy last week? Reading// I finished We Are Not Ourselves by Matthew Thomas a couple of nights ago. Easily one of the best books I've read this year, it left me an emotional wreck. I'll post my review around its publication date later this month. Something lighter and sweeter was definitely in order after that and The Storied Life of A.J. Fikry by Gabrielle Zevin has come to my rescue. I'm loving this one! Listening// Imperial Woman by Pearl S. Buck is still occupying my limited audiobook time. I'm 55% done and like it, but not quite as much as The Good Earth, Pavilion of Women, or Peony. There's still plenty of time for it to pick up though. On the blog// Since I was consumed by We Are Not Ourselves last week, things were fairly quiet. In the kitchen// Twin A had her wisdom teeth removed this week so, even though it's high summer, I've been making soup. Her favorite is Split Pea (which I'd never made), so I decided to try a recipe from David Lebovtiz. It was delicious! Sadly, there is no way to make a photograph of Split Pea Soup look appealing. You're better off not seeing my attempts... trust me. Looking ahead// A quick look at my reading list for the year shows I've been reading predominantly new releases lately. That's unusual because I'm normally a classics, backlist, wait-til-it's-out-in-paperback kind of reader. Starting this fall, I'll be returning to my old habits. One of the titles I'm considering is An American Tragedy by Theodore Dreiser. Are you making fall reading plans yet? Summer always flies by, doesn't it? I think school starts in a couple of weeks here. Kathy - Summer is always the shortest season! I hope that Twin A is feeling better! Good mama to make her soup in the summer (and yes, no way that split pea looks appealing, but YUM!). I'm so glad to hear that AJ Fikry is doing the trick for you. It's such a neat little book. Enjoy the rest of your weekend! And changing leaves...I hope not!! Trish - The swelling finally seems to begging down today, but she still can't each much. I may be making black bean soup tomorrow! I was such a wreck after We Are Not Ourselves, but could tell after just a page or two that A.J. Fikry would be the perfect follow-up! I think green soups always look horrid. I am yet to be tempted by one. But they taste heavenly! So I completely believe you. I love the Fall season, so I'm looking forward to it. But I know what you mean - I don't think we had a proper summer yet. It hasn't been as hot as it has been in the past (thank goodness) but it also seems to indicate that maybe winter is not that far off. I'm thinking of planting black-eyed susans next year! Harvee - Black-eyed Susans one of my favorites! I'm going to need to thin them out next spring... they're practically taking over the flower bed. I am enjoying We Are Not Ourselves, although I learned that I can't read it in bed...LOL. I have the paperback version, so it is very heavy. I always feel a little crotchety when people love books that I didn't. :) I'm glad you're enjoyed Fikry because I really, really meant to. Fall reading plans??? Ha! I don't even know what I'm reading next week! LOL And yes I remember hearing about We Are Not Ourselves...but OMG it is over 600 pages long! I find that to be scary. Now Fikry, I can do that. I just loaded it on my iPod, up next after The Silkworm! Sandy - Maybe I should have said fall reading projects? I want to get through at least one big classic and return to my backlist roots.We Are Not Ourselves left me an emotional wreck, so I can't recommend it in good faith without reservations... but it's an amazing book and never really felt like it was 600+ pages. I enjoyed The Storied Life of A. J. Fikry too. Heidi - A.J. Fikry seems to be exactly what I need right now! I have daffodils trying to tell me Spring is coming but it sure doesn't feel like it. Sebastian Barry left me an emotional wreck last week - I turned to crime for light relief. Cat - Oooh, which Sebastian Barry? I read The Secret Scripture and have A Long Long Way in my tbr pile. School for my older kids starts Tuesday. Needless to say they aren't thrilled. Poor Twin A getting her wisdom teeth out. Hopefully she's feeling okay. I really enjoyed A.J. Fikry. It brought adjectives like delightful and charming to mind. I could use a literary cocktail at the moment! I may have to go find that book! Have a great week! I've had my eye on We Are Not Ourselves but am hesitant to start it because of the high page count. 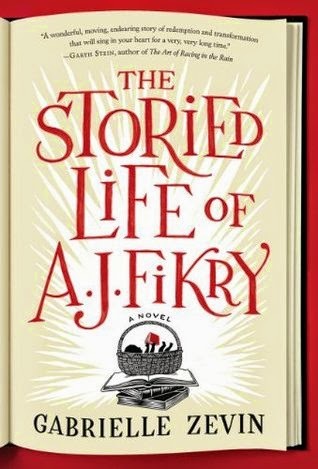 I have The Storied Life of A. J. Fikry on my library TBR list. When my kids were little, my daughter loved split pea soup so much she was always putting bags of it in the cart. The boys always stuck junk food in it. The summer does seem to have gone pretty quickly, especially to everyone who had such a long, cold, snowy winter. I don't want to think about school starting or Fall quite yet! I hope to listen to The Storied Life while I help my mom get ready to sell her condo next week. Nise' - The Storied Life seems like such a sweet book. I think it would be good on audio, too. oh I absolutely adored AJ Fikry's novel! and I've heard We Are Not Ourselves is quite the emotional read - I hope to get to it sometime this month! Hope Twin A is recovering nicely. Have a great week! Stacy - Yes, We Are Not Ourselves is very emotional... especially if you are or have dealt with Alzheimer's in the past. Greg - Here's to making the most of what's left of summer! I love fall, but am not ready for it quite yet. Have a great week! Angela's Anxious Life - I usually add the link to the 100Happy Days website, but forgot it this week (http://100happydays.com). I didn't officially sign up anywhere, but am just trying to post a photo a day on instagram. Some people just do it twitter or Facebook, or whatever works for them. I suppose you could even post it on your blog if you'd like! Your happy Days project is great. I love Split Pea Soup too. I'm going to check out We Our Not Ourselves. I love to me an emotional wreck sometimes! Pat - My husband usually hates it when I read those "emotionally wrecking" novels... always asks when I'm going to be done, lol! You make me hungry for split pea soup. My mom always used yellow split peas which I can't find anywhere. It still wasn't visually appealing but that is the color pea soup should be for me. I love it when I read a book that sticks with me. Most of mine don't. Come see my week here. Happy reading! Kathy Martin - I've never seen yellow split peas... wonder if they taste the same? anyway, split pea soup is fast becoming a new favorite around here! Sheila - Summer always seems like the quickest season, especially in this part of the country.Will definitely try to enjoy what's left! I totally agree, this summer is flying by way too quickly!!! It is making me sad. Tequila Mockingbird sounds awesome, I really need to get it. Quixotic Magpie - Tequila Mockingbird is a lot of fun... doesn't matter if you actually sample the drinks or not! Stormi Johnson - The Storied Life of A.J. Fikry is turning out to be exactly the kind of book I'm in the mood for now! Hope you can read it soon. Joy - A big trip sounds wonderful... and definitely requires some planned reading! We are Not Ourselves has been on my wishlist and I debated requesting from NetGalley in the past. I should read this one, as some other bloggers have concurred with your opinion of it. The Storied Life... definitely needs to be read. Enjoy your week-- I'm glad you enjoy your happiness project. I really want that literary cocktail book, it looks like such fun! We Are Not Ourselves sounds like a book I shouldn't miss. I hope your daughter feels better soon. I remember getting my wisdom teeth taken out. Luckily, my dentist was fantastic at his job. It didn't occur to me to even start making fall reading plans - and it's something I always do! Hmmm. ..
Vasilly - Be prepared for an emotion read if you choose We Are Not Ourselves... but it's so good! My daughter is finally starting to feel better, although she still isn't eating real food yet. Hopefully within the next couple of days. Irene McKenna - We Are Not Ourselves is wonderful, but a difficult read especially if you have experience with Alzheimer's. I've made quite a few milkshake runs over the last several days, too - lol! I'm about 10% into We Are Not Ourselves...I like it, but am having a bit of trouble getting into the story. I think I'm having issues w/ the time flying by so quickly that I can't get to know the characters well...it went from 1938-1964 in the first 8% of the book! Hoping time will slow down a bit! Sarah - The beginning moves very quickly, but once Eileen hits adulthood it does slow down a little. Hope you like it, Sarah! I had We Are Not Ourselves from Netgalley but before I could read it, it said it expired. Since it wasn't close to the pub date yet, I'm not sure why that happened but I was so frustrated and now even more so! Lisa - Oh, no! That's so frustrating. The more I think about that novel, the more I like it.